Labor is never easy. I experienced it three times and it was hard every time. However, the first labor and delivery experience was the hardest and it did get easier with each child. 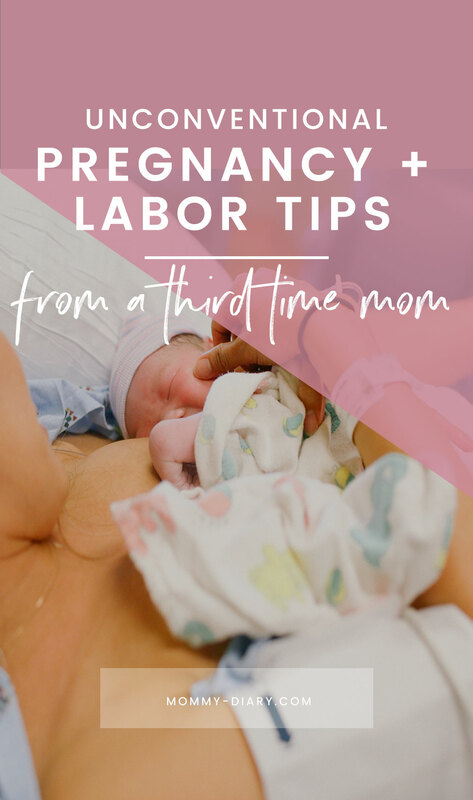 There are some things about labor and delivery that I wish I knew the first time and I wanted to share some of these with my readers. When I had my first child, I was shocked that even with weekly doctor visits, reading pamphlets from the hospital and books like What To Expect When You’re Expecting, there are so many things I wasn’t prepared for. After talking to other moms, I learned many felt the same way, unprepared and under-informed. 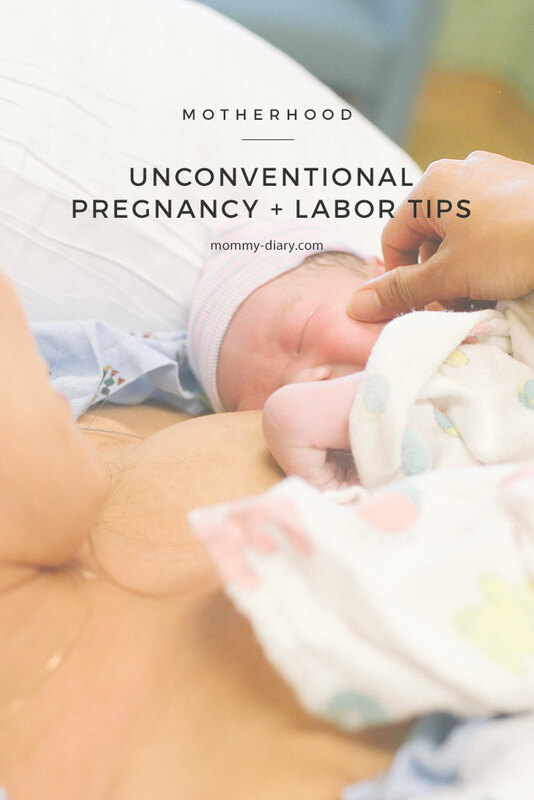 So here they are, unconventional pregnancy and labor tips from a third time mom. I hope you find this list helpful. Third trimester is the hardest for most moms. This is when you experience pelvic pains, sharp shooting pains that shoot up and down your legs, cramps, swelling, insomnia, backache (and many other mysterious aches) and every other discomfort you can think of. One thing pregnancy taught me is that every discomfort is considered “normal.” And that last week will feel like a year. Hang in there mama, you’re almost there. I know you hear this a lot and it’s easy to ignore it. But PLEASE DON’T- and try not to do much even if you feel lazy. As due date nears, mothers usually feel a mixture excitement, nervousness, fear, anxiety and joy. Having to use the bathroom many times in the night and all the discomforts you may be experiencing makes it hard to rest at night time. You may even feel a surge of energy. But please resist the urge to go on a cleaning frenzy or doing anything strenuous. It’s okay to be lazy- you’re being productive enough by carrying a baby inside you. Exercise is good for pregnant women of course, but if you’re in so much discomfort and pain, sometimes rest and relaxation are exactly what you need. Listen to your body. Induced labor and natural labor are two complete different birthing experiences. Avoid being induced unless it’s medically necessary because it can lead to more problems and more pain. Induction in labor means contractions are stimulated with synthetic hormones called pitocin. This shouldn’t be standard procedure unless it’s medically necessary because induction can lead to emergency C-section, infection and other problems. Unfortunately, many doctors do not inform mothers of this and many mothers are led to use pitocin to stimulate labor for non-medical reasons. I was induced with both my first and second child and it made labor, delivery and recovery much more painful. Here is why. When you are induced before your body goes into labor naturally, you can experience painful contractions without dilation. This is especially true for your first child. When you are induced, your body is being forced to deliver your baby before it’s truly ready. This can lead to many unforeseen problems. Induction also means recovery can be that much harder because your after-delivery contractions are much stronger. I wish I knew this and said no when the doctor offered to induce me on my due date. I should’ve waited. In contrast, my third labor & delivery was so much easier because I avoided induction at all cost and allowed my body to go into labor naturally. Even if you want to get the baby out ASAP try to wait it out even if you are overdue. Let your baby come out when he/she is ready. This may seem controversial but after having three kids, I learned that there are many things about pregnancy and labor that male doctors fail to understand. I mean, how can they? They’ve never experienced carrying a child and learned all their knowledge from books and previous patients. Don’t get me wrong, my doctors were knowledgeable and helpful. It’s just that there were moments when I was glad I had other mothers to turn to, not just my doctor. For example, I loved talking to my 20-week ultrasound tech (who was a mother herself) because she gave me a lot of good information about what to expect during that time of my pregnancy. I also got a lot of tips and useful information by talking to other pregnant moms in the waiting room. Having three kids made me realize that other mothers’ resources and stories are just as valuable as the doctor’s instructions. Ask questions, listen to their story. Sometimes real life experiences are more valuable than book knowledge. After my daughter came out I was shocked when the doctor asked me to push again. What? Push what? I can’t believe no one told me that we have to “deliver” the placenta after the baby. Isn’t this a very important piece of information that we should be aware about? And how about post-labor contractions? Did you know contractions continue even after the baby and it can be very painful, just like the real thing? Post-delivery contractions are especially painful during breastfeeding so be prepared for this. And there will be a lot of bleeding, pain, sleep deprivation, hormonal irregularities among other symptoms. You may also experience weepiness, headaches and break out in cold sweat (this happened to me with all three of my babies) so be prepared and don’t be surprised when you experience these symptoms. After raising a special needs child, experiencing postpartum depression, then finally learning what motherhood is really about, I want to reiterate how important finding your village is. Ask questions, seek help and connect with other moms during pregnancy and after. Don’t just rely on your doctor, husband or mother because 1) they don’t always understand and 2) many things have changed in the past decades. My third pregnancy was so difficult that I really doubted myself and my body. I experienced very long early labor (2-3 days) so I doubted if I would ever go into labor naturally. I felt so much pelvic pain towards the end of the pregnancy that I thought my bones will break. I was in so much pain after delivery I wondered if my body would ever be the same. The pain during a pitocin-induced labor was so extreme, I thought I was going to die. For whatever reason, you will face moments when you doubt yourself and your body. Don’t. Your body knows exactly what to do. You were meant to do this. Trust your body. Having a baby is not a sprint, but a marathon. You need a lot of energy, patience, endurance, strength and support to get through those early months. Then when the newborn stage ends and you’re finally getting adjusted to things, another chapter opens and you have a whole set of skills and milestones to learn and adjust to. Motherhood is a journey that never ends. Sometimes you’ll struggle, sometimes you’ll feel like you’re doing an amazing job. Such emotional rollercoaster is entirely natural and normal. Pregnancy, labor, delivery and postpartum can be the most joyous and most difficult time of a woman’s life. It’s not meant to be easy and it’s not always natural. But remember to always trust your body and know you were meant to do this. Listen to your maternal intuition. These days we’re bombarded with so much information that we believe we know a lot less than we actually do. I believe that most women are born with the gift of maternal intuition and love for our offspring. Don’t be too anxious or worried. You were born to do this. What do you think about my unconventional tips? If there is one advice you can give a new mother about pregnancy, labor and delivery, what would it be? I love these tips! Especially trusting that your body knows what it’s doing and talking to other mamas! It is amazing how our bodies and our babies know exactly what to do. Yes I still find that to be one of the greatest miracles and mysteries of motherhood! Im gearing up for my third delivery and am excited for it. I agree, my first delivery was not the best but my second was quick and easier to manage so Im hoping for another fast one come September. Definitely believe in trusting your body and your instincts! Yes and yes! I agree completely about being induced. Sometimes it’s necessary (I was induced at 8 days overdue with my first because I was in “latent labor” and when they broke my water they found a lot of meconium and were concerned about my son), but the labor was SO hard. I didn’t know until afterwards that pitocin actually intensifies the contractions and they are usually more painful than normal contractions. I think I would have needed it anyway, but I was so grateful that with my second, I went into labor naturally, and the whole process was so much better! Yes my first induction was medically necessary but my second one wasn’t. The doctor didn’t even inform me, he simply offered it and I said yes because I was so tired of being pregnant. The third time I went into labor naturally and it was soooo much easier and pain was more manageable. I just wish I knew sooner! these are all such great tips. I love the list! Great job! I was induced my first pregnancy and I was so shocked at how quickly the pain began and only increased. I had read it would gradually increase, but didn’t take into account the pitocin would affect me so quickly. Great read! Great advice! It’s so true that there will probably come a time when you doubt your body. I felt like I would never go into labor with my second. He came 9 days after his guess date. But everything turned out perfectly and I wish I had just trusted my body to do what it needed to! I agree with avoiding inductions whenever possible. Leads to unnecessary interventions. I think these should be mainstream tips!! WHY don’t more people think this way!?!?! I’m RIGHT with ya!! I know, right? But many of these are still “arguable” I guess. I think with more awareness, more mothers will know what really happens during and after labor. Thank you for reading! Oh my goodness!! There are so many great tips here! Love asking other mommas their opinion because you know they’re right in the thick of it too! Yes me too. I think the more we share, the more we ask questions, the more we connect, fuller our motherhood experience becomes! I agree. I wish there were more real information for first time mothers out there! These are all great tips especially to new moms. I wish I had a blog, read blogs or connect to bloggers when i was pregnant and or just had a baby, that way I’ll be more informed and have that support system, even if its just online. I am the first to have a baby among all my friends and it was hard, coz sometimes they think that you are just doing ok and people just thought that the struggle is just normal for a mom but it’s tough. I was in the same boat and it was really hard. I was the first one to have a baby out of my friends and no one seemed to understand my struggles. I was so lonely and even suffered ppd. Looking back, I can’t believe I survived! This time around I’m so much happier thanks to my blog and other mom friends online and on social media. It helps me to feel not alone. I totally agree that most first-time moms are not education enough about the process (me included!) there are so many things I plan to do differently the second time around. Hindsight is 20/20 though and I think it can be hard to truly understand everything that will happen during pregnancy/delivery. It’s great for moms to have tips like these to help. You’re so right that hindsight is 20/20. Even if I read these tips as a first time mom, it won’t actually help like going through it firsthand. It helps so much. I can honestly say this is what is making my third time motherhood 10000x easier. I wish someone warned me about the postpartum sweating! I was so embarrassed because it would happen while I was eating. These are great tips. Thanks for sharing! Expecting baby #3 in May and I feel like you can never be prepared LOL I wish someone told me how hungry and thirsty I’d be while nursing. When I got home from the hospital I ate anything and everything I could get my hands on! That’s so true. I’m still always hungry and thirsty and my baby is 7 months old. This is a very real and honest take!! All things I’ll keep in mind when we are hopefully blessed with a third!! Thank you for reading and hope God blesses you with a third! It’s the greatest journey ever! I totally agree! Mom’s need to trust their instincts and avoid being induced if possible. So many doctors push for early induction because it’s convenient for them.